Are you looking for something to do this weekend? I know it’s going to be hot and steamy outside but inside the Mall of America it’s cool and comfortable! Plus they are hosting the Space Scooter Coast to Coast Challenge this weekend in the east rotunda on the first floor. 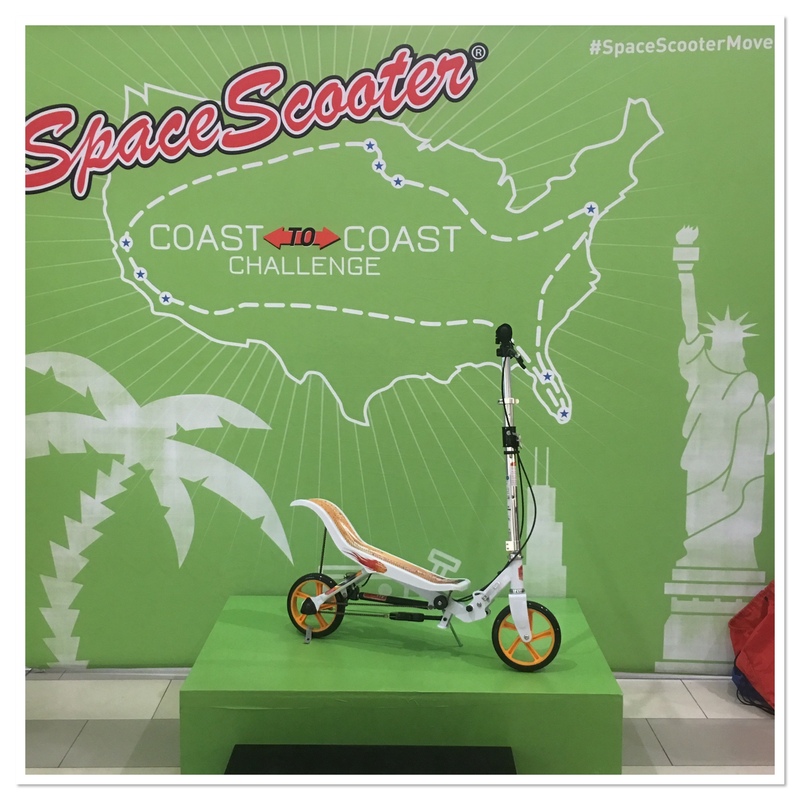 While at the Coast to Coast challenge kids will be able to ride a Space Scooter around a course! Your child will get to experience the Space Scooter first hand. And while you are out there you can pick up a coupon for $10 off your own Space Scooter. Are you wondering what a Space Scooter is? They are huge in Holland. And I predict them to be huge here in the US. Space Scooter is a scooter that is propelled forward by an up and down teeter-totter motion. Unlike traditional scooter where you are constantly using your foot to push off, making for a jarring ride, the Space Sooter has suspension and a smooth ride. Plus you won’t tire as fast because a Space Scooter uses the equivalent amount of energy as riding a bike. Since your energy output is similar to riding a bike this means you can go further. With the Space Scooter you can use it around town, on road trips, vacations or to and from school. Another benefit is the size. Unlike big clunky bikes, the Space Scooter folds down, becoming compact enough to fit inside a locker or duffel bag. Space Scooter also comes in 2 sizes. One for the little guys (4 years old to around 8) starting at $99 and a larger one for 8 years old and up starting at $149. If you can ride a bike without training wheels then you can ride the Space Scooter. Space Scooter are currently available at Toys R Us and Amazon. This is a really cool scooter. Thanks for sharing. I live in Pennsylvania so this won’t work for me. Love the looks of that scooter!! Looks pretty sturdy. that is a pretty neat looking scooter. i have never been much of a fan though b/c you can really get hurt. however, this event is in a safe environment.